I had visions of immediately firing off a press release with some discussion, but I find myself a bit distracted by a matter that has arisen: another rock slide. As regular readers know, I commute (because my house has not sold) from Tennessee to North Carolina, and back, each week to meet my employment obligations as an entrepreneurship professor. This link provides more context than the YouTube video above: workers were already on site removing one large rock, and a news crew was filming that event when even more came down. P.S. Don’t worry Chase, I’ll be able to make it to work so that I can finish paying you off. You see, the rock slide only blocked my second alternate route; it didn’t kill me (although you probably wish it had because as long as I’m breathing and you have not met my demands, I’m STILL COMING AFTER YOU!). Posted in: "Bail Out", Dirty Tricks and Traps, Entrepreneurship, Join the Fight. Friends don’t let Friends use Chase Bank. It’s not like I can contact the credit card company and get them to stand behind the product I purchased with their loaned money, so the gall of them to charge up to 30% interest makes it a mobsters in suits enterprise. Marv, even if the margin is only 16%, it’s 16% of a lot of money. The McDonald’s example is not necessarily valid because the entire process is heavily employee related. The amount of paid people hours in the credit card industry versus the amount of money that they loan out is nowhere near as intense as the amount of McDonalds workers actually servicing each and every transaction. Plus, customers that mess up and can’t keep up with payments will face a few years of even higher interest rate charges because of past mistakes. 16% as a top end rate is fine by me. I’d rather have less credit available if banks are more worried someone won’t pay it back because their profit margin is less. The guy with the multiple accidents/DUI’s should not be allowed to drive at all – revoke his license. He is putting everyone else at risk by being on the road. The same applies to people who are bad credit risks – don’t offer them credit at all. The high interest rates that are currently allowed merely serve to create debt slaves for those who choose to attempt to pay the debt. When these people ultimately default, the risk is passed on to other customers who are not to blame. The ability of the banks’ to charge usurious rates of interest merely acts as an irresistible incentive to trick customers into defaulting. Paying a bill ONE day late, should not automatically place a customer into an extremely high risk category. As long as the banks are allowed to skirt state usury laws, they will continue to employ these tactics. Obviously higher risk customers should pay more. Do you feel that your auto insurance should cost the same as the guy with multiple accidents/DUI’s? Alessandro I don’t know what the basis of your insight/opinion is but I actually managed a lending institution for some time and have some sense of the cost associated with the business. The costs to a responsible lender to make sure of the ability/intent of the borrower to repay are/should be considerable. This is without regard for such things as the costs to operate offices, advertise, staff customer service, send bills, develop IT platforms and interfaces etc. The fact that the actual commodity is currency does not reduce overhead. No other business I have been involved in would consider 16% a good annual margin even if it were pure profit. Only a fraction of it is because of the costs I have listed. That is the highest rate you feel is appropriate? Mcdonalds makes $.08 per Mcdouble (Lowest margin item) They keep less than 3 days inventory on average. This means that they turn that same $1 one hundred and twenty times in the year which you propose a lender recieve less than 16% gross margin for. This is over 60 times what you feel is appropriate for card providers to make and they have no risk of non-payment. Not sure I follow Anna’s rant but that friggin clown scares me more that my banker. It seems Chase is onto a new game. It is sending out new credit check offers to cardholders promising a low interest rate for a short period of time. As soon as the cardholder uses the check, Chase does not honor it, saying the line was cancelled. This triggers the cardholder to be overlimit. Chase then charges the overlimit fee, lowers the credit limit, and then raises the current card rate. Read all the posts in consumer affairs.com. Sorry, the last sentence was clearly typed in a hurry. What did I say the other day about scientists? Well, wrong. The problem is with insane accumulation of wealth/power by the most ruthless. Everything else is a derivative problem. I am embarrassed to say the obvious. What did I say the other day I say about sicentists? Higher interest rates for people who are higher risk actually makes little sense. Better to tell people no credit for you than ensnare them into a rate that they will never be able to pay down and that will perpetually eat away at their income for the rest of their lives. 16% is PLENTY. There is no physical product involved, it’s just money, and as we all know, banks can get it replaced when necessary from our own government. Some companies can’t even mark up their PHYSICAL PRODUCT as much as what credit card companies are charging in interest rates. So when banks charge 30% interest on money, yet businesses may only be able to mark up their own profit margin 15-20%, all I can say is “Houston, we have a problem”. This is like charging a parking fee that costs more than the actual entertainment one is going to see. With all due respect Alessandro. Ths is a red herring. Our issue is not the free market concept of higher rates for higher risk it is the idea that a lender can unilaterally raise rates mid-contract with no change in lending risk. Surely you see that costs are being shifted to us precisely because we can and do pay. This would not occur if high risk lending was contained by free market concepts that the right advocates. It is only the refusal of this administration to prosecute lenders for breaking thier terms to us which divert the focus to high interest rates. The problem is not how high rates are. It is that they apply these higher rates to low risk accounts after they promise them competitive rates and the customer invests in the contract by restructuring finances contingent on the agreement or pays an up front fee for the transfer. Has nothing to do with the Republican position you cite at least in the context you allude to. It is clear that if lending occurs to some borrowers the cost of that lending will exceed 16%. If the lender does not charge the customer for it…he will attempt to shift it to lower risk accounts to preserve his margin. Republicans are attempting to protect the responsible borrower from paying charges which rightfully should be born by those who cause them. Which type of borrower are you? The latest is the democrats are trying to bring forward legislation to cap credit card interest rates at 16% and the republicans are against it. It is such a strange time, we have a president who has the support of community activist groups and the banks, and we have republicans opposing lowering credit card interest rates to something that is still high, but more survivable. Twas bout this time last year when chase decided to give a present to half a million of thier best customers. They wanted us to be free from the shackles of credit card debt sooner than we had planned and magnanomously took the unilateral step to triple our rates for our own good. What a Guy this Mr Dimon! He and his worshiper Barack have done us all a solid. This Christmas, we will all pay cash and the whole list will get lifesaver storybooks or lumps of coal. Saw this on UppityWoman blog – it may be of interest to those of us who have been in the battle with Chase now for almost one year…. The thought of this is making me sick to my stomach. Jamie Dimon for Treasury Secretary: The Contradictor in Chief? Chase is trying to bolster its image. Look at all the new card commercials about how you can name your own payback terms! Chase will eventually hurt. The mortgage meltdown has not occured yet. When unemployment insurance benefits run out in january, another nail will be hit in the coffin of the wamu accounts. As well, thats when manufacturers will start to layoff. Everyday, I hear of more impending layoffs. Credit cards will suffer big time; slow or on merchant sales after the year will decrease revenues. Chase will not have its two million customers to turn to for new purchases! Wait.,,,the tide will turn. It wont be immediate, but it will turn. There are some other interesting developments as well regarding credit cards. By simply canceling credit cards, the credit card companies can completely circumvent the credit card reform act of 2009. Wow. “It can be incredibly rewarding when your vote has a local impact. Chase is giving away $5 million to various charities and needs you to help pick which ones. Simply vote for your favorite nonprofit and then get friends and others on Facebook to do the same. You can select from over 500,000 charities that focus on education, healthcare, housing, environmental issues, combating hunger, arts and culture, human services, and animal welfare. Give your charity the recognition it deserves and needs with Chase Community Giving. It’s a new Way Forward for giving. Considering the number of people that Chase has put out of their homes through delays in processing their mortgage modifications, foreclosures, etc., I find Chase’s offer to contribute to housing charities unbelievably hypocritical. It is obvious that Chase is only interested in the tax deductions and PR and not improving peoples’ lives. I certainly am not fooled. Disgusting! We are probably being “tallied” as people they “saved” so they can get more bailout money. Seriously, it would not surprise me if all of those low interest rate accounts that were reset to the five year plan might serve some ulterior motive for Chase. However, if that actually were true, then they blew it by keeping the 5 year pay down program a secret. I entered the BLP program back in August and I received a letter today from BLP customer service thanking me for taking the steps to handle my debt during my hardship and how they appreciated my continued payments during this hardship. BLAH BLAH BLAH….This really infuriates me since I was not having a hardship until they created 1 for me and the fact that they called me, I did not call them, to offer the BLP plan. It’s like they still want to make it look like we did something wrong and they rode in on the white horse to save the day. It also makes me feel like they just want to keep rubbing it in. I just want them to leave me alone!!! It’s like they had to borrow our money for a while knowing they might one day give it back. Did you close out your account and then get the letter? That would be kind of a scammy move by Chase because they got what they ultimately wanted, your loan off of their books. Giving back the excessive interest rate charges is a scam unless they offer you a new loan at the original low interest rate. However, who would trust them now? I received a letter from Chase informing me that they were refunding the interest on my account from the change in terms that had boosted my rate to 7.99%. I Believe, just my speculation, that THEY KNOW that they are going to lose this battle on the legal front. It will make me mad, if this removes me from being a plaintiff in the Change-in-terms lawsuits. The harm to me was more than just the interest rate. I was in the midst of building a new how, and had to take out new loans to pay them off, because the change-in-terms really messed with my debt to credit ratio. Now they want to turn back the clock, after the damage was already done. I could care less now about the refund, the damage was already done, and I now have a “0” balance on the two cards I had with them. Thank you Dr. Lahm for all that you have done! Wow, that video was amazing. 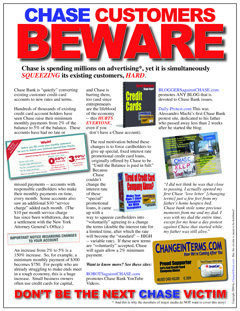 chase credit card fee change in terms credit cards interest penalties progaganda credit interest rate consumer credit minimum payment www ecommerce-journal.com debt banks credit card fees fees Class Action customer service Ohio lies told by Chase Congress economy complaints notices advocacy monthly minimum payment extortion Chase credit card; wall street journal; consumers FED chase credit card complaints small business Testimony Truth in Lending Chase Credit card abusive lending Jamie Dimon JP Morgan chase class action regulation credit card abuses business credit Chase class action lawsuits Chase Poisoned Example Spreads....but at least there is an OPT-OUT "Bail Out"